. : Eload/Emend Marathon Race Report: Gatineau Loppet Weekend - My Strangest Race Ever! :: Ski XCOttawa.ca :: Skiing in Ottawa and Gatineau Park :. Eload/Emend Marathon Race Report: Gatineau Loppet Weekend - My Strangest Race Ever! This was my strangest Gatineau Loppet race ever, which is something, because I've competed in this event many times (so many, in fact, that they've honored me as their first "legend," in part because of my loyal participation . . . ). 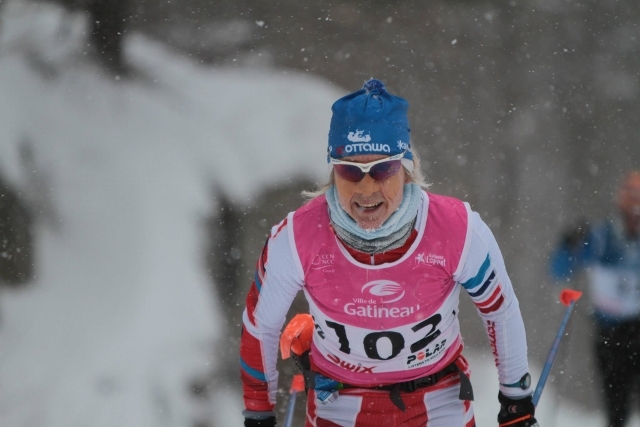 If you're not familiar with the race, the Gatineau Loppet is the biggest cross-country ski race in Canada. This year marked the 37th running of the event, and attracted skiers from 20 different countries, including some speedy skiers from China. The signature competitive event this year was the 51 km Classic race, which would serve as the Canadian Long Distance Loppet Championship. The course featured a fun point-to-point format that had skiers traveling from Wakefield to Gatineau. Here is the course map. Athletes were bused to the start of the event, which adds some anxiety (there's not much time to warm up, or to figure out if you have the right grip wax for the conditions), but also to the fun: I sat beside an Estonian who spoke no English, and I spoke no Estonian, but we managed to converse in "ski language" for the 40-minute bus ride. Several of my XC Ottawa teammates were competing as well. Teammates certainly make the race more fun! After getting off the bus, we had a bit of a surprise. It had snowed so much overnight that it was actually hard to discern any tracks in the start area or race trail, since they were all snow filled! I didn't really mind (different conditions can change things up in interesting ways!) and the new snow did make things pretty spectacular. A quick test of my skis revealed that I had great grip and glide. The start of the Men's A Wave (Gatineau Loppet Photo). The elite women's field started 1 minute after the men's A wave of about 90 racers. We started to catch the slower skiers of the A wave after only a few minutes (I didn't worry, because this happened last year as well). It was tricky skiing, because there was only a single lane of skier-groomed trail, and passing meant going out into deep snow, which uses a lot of energy. After about 7 km of zigzagging, we had actually made it up towards the front of the pack with the elite men, who were breaking trail for all racers. I was skiing with my teammates Megan and Ingrid, and Hongxue Li of China (she's fast - Hongxue was 22nd at the 30km distance at the Sochi Olympics!). At the 10km mark as we went over the timing mats, Megan and I joked that we were leading the race, since we left 1 minute behind the men. (Actually, the eventual leader at 10 km was a skier from the D wave that left about 6 minutes after the A wave, benefiting from the slow pace of the leaders, and the skiers grooming the trail ahead). Trail 36 - one of the beautiful trails we skied on (we had single tracks though!). Photo by Jo-Ann Holden. At this point it was obvious that it made no sense to expend energy to pass, so we all just settled into a single line of racers, and skied at a very pleasant pace through the beautiful scenery until about the 20 km mark. I was actually enjoying myself and the relaxed pace quite a bit, and thought how unique it was to be able to ski so close to my male teammates, and chat with eventual race winner Ian Murray (who double poled the entire 51 km), my Estonian buddy from the bus, and race favourite (bib # 1) Sebastian Townsend. There was a lot of stop-and-start action because of the rolling trails: it was like rush-hour traffic or bumper cars, and at the bottom of every small downhill, skiers would crash into one-another, come to a stop, and then scramble up the next uphill. It was actually pretty comical and entertaining, but I realized the entire race might not all be this pleasant. I had a great nutrition plan, but was having problems executing it - it's hard to eat and drink in a tight line of skiers with a single track! I was looking forward to my first XC Ottawa feed (bottle with eload/fly combination and an eload gel), but missed it since we were all unexpectedly bunched together. Things started to speed up and spread out at about 25km. I was skiing with China's Li, and she put a nice gap on me on an uphill. After O'Brien (30 km) the real climbing starts, and I felt pretty terrible! I finally took the time to have a gel, which kicked in after the seemingly neverending Fortune climb. My typical experience in distance races is to feel stronger as the race goes on - but I guess this longer than anticipated race time and poor early nutrition was taking it's toll. I successfully grabbed my second feed from Nevin (eload/fly bottle and eload gel), and then didn't hesitate to down any gels I had on me and stop at all remaining feed stations: the sugar and any men I could latch onto helped bring my body and mind to the finish. The conditions meant that the race was about 1 hour slower than anticipated - and it was pretty tough going, since most of the parkways were also deep snow. I ended up 2nd behind Hongxue, and Canadian Distance Loppet Champion. Sunday I raced the 27km freestyle event. I've done back-to-back loppet races twice before, and I never expect much out of the 2nd event. I'll be racing a 30km skate event at Canadian Nationals in March at the end of a week of racing, and also thought racing with a tired body (and mind!) might be good preparation for that. The cold weather forced organizers to shorten the race to 22 km. Taking windchill into account, apparently Ottawa was the coldest capital on the planet over the weekend. The Start/Finish area of the freestyle events is on a very windy open field, which was not that inviting. Many racers (including myself) postponed the inevitable, waiting in the warm indoors until the last-minute to go out to the start area. So I didn't really warm up properly for the event. A sluggish body, no warmup, and cold temperatures isn't a optimal combination for a good race start (a good warmup is still important in Loppets, because the start can be very fast). Getting out quickly means you can ski in a pack with fast skiers, which is a definite advantage on windy fields and parkways, much like cycling. As anticipated, my start wasn't great (and a skier fell in front of me), but I did start to eventually feel better on the first climb in the woods, at about 7 km. I ended up finishing 2nd woman, behind China's DanDan Man. All in all, it was a tough but good weekend of racing for myself and my XC Ottawa teammates: Ingrid finished 4th, Megan 5th, and Katie 12th. On the men's side, Karl finished 3rd and Arthur was 18th. We all really appreciated the help of Mike, Nevin, and Mark who helped us with feeds, and Craig Storey, Peter Rozmovits, and John Suuronen who figured out the best wax to use in these conditions. Special shout-out to Ian Murray (XC Ottawa alumni), who raced both days and won both distance events. A big thanks to the many volunteers and Gatineau Loppet organizers, who put on another great event in very challenging conditions. Anyone who was out cheering on these cold days also deserves a medal! You’ll find more of Sheila's Racing Updates here.